The Rolls Royce Cullinan is currently the most expensive production SUV in the world, beating the likes of the Lamborghini Urus and the Bentley Bentayga by quite a margin. With its great price come even greater features and comfort that could beat a jetliner any day. In India, the Rolls Royce Cullinan costs Rs. 6.95 crore (ex-showroom, Delhi), which makes it one of the most expensive vehicles on sale here. A few examples have already been bought in India including one by the Ambanis. Moving over, let’s get to know some of the coolest features this SUV comes with. Check out the video below by Supercar Blondie to see the Cullinan in its full glory and check out some of its mind-blowing features. To let you know, the Ambani Garage is the only one in India to have a Lamborghini Urus, two Bentley Bentayga and the Rolls Royce Cullinan under the same roof. As it is now said, only Ambanis can make such a thing happen. The Cullinan in the video comes with a Tuscon Sun paint shade, which looks quite good on the vehicle. Apart from its already humongous price, the customization options available on this SUV can take up the total cost much above than the base price. The split tailgate of the Cullinan comes with special picnic seats along with a pull out trays that make any outstation tour enjoyable. Also, the temperature of the cabin won’t be affected if the tailgate is opened as a glass partition is placed in between to ensure nothing comes between you and luxury. 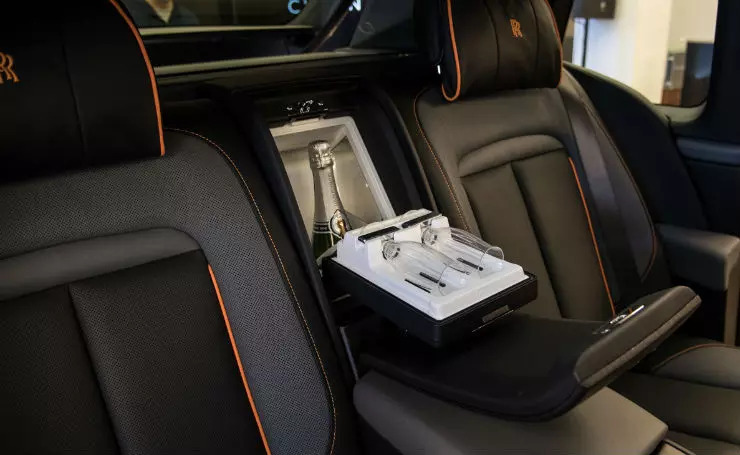 Talking about some of the features of the Cullinan, the rear centre console houses crystal Rolls Royce branded glasses and decanter and a chiller behind it. Moreover, it gets heated armrests, multiple driving modes, a 360-degree camera with the birdseye view, massager in the rear seats, starlit roofline, specially customised tyres, carefully selected real wood with matching grains, self-levelling suspension. Rolls Royce cars are known to be the last name when it comes to automobile luxury and the Cullinan proves that in a very effective manner. The doors can be closed by the push of a button saving you the inconvenience of handling those heavy doors yourself. The Rolls Royce Cullinan is powered by a 6.75-litre V12 petrol engine that generates a maximum power of 563 Bhp and a peak torque of 850 Nm. The engine comes mated to a 6-speed automatic unit. All this power ensures that this 2,660 kg behemoth moves swiftly despite its bulk. 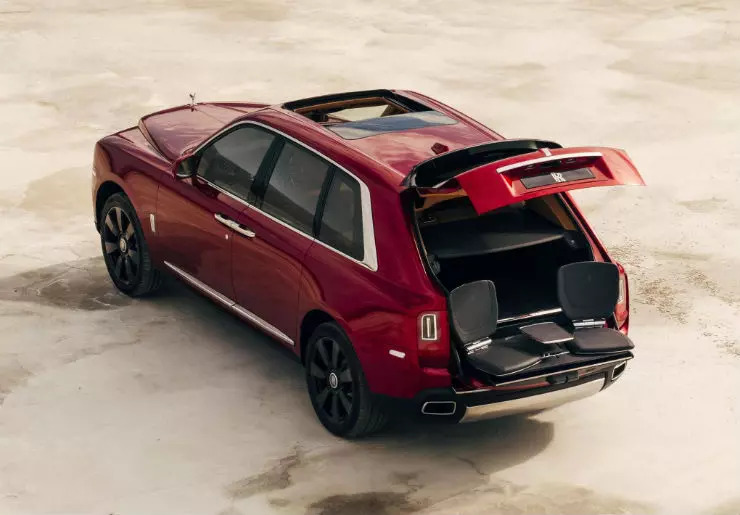 The cabin of the Rolls Royce Cullinan is acoustically sealed, which ensures absolute silence for its occupants. The leather upholstery on the car is of the best quality selected by Rolls Royce people themselves. Another unique feature this SUV comes with is an automatic umbrella dryer, which keeps the Rolls Royce insignia marked umbrellas dry when you put it in the specially made slots in the doors.